Rossi & Rossi was founded in 1985 by Anna Maria Rossi, and in 1988 she was joined by her son Fabio. 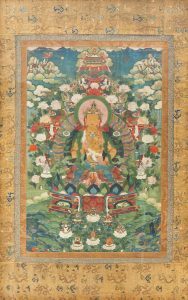 Together, they have established a reputation as leading dealers in traditional Indian and Himalayan art, early Chinese and Central Asian textiles and works of art. Over the last thirty years Rossi & Rossi has handled some of the finest ancient and antique works of art from the Himalayan region, particularly Tibet, Nepal and Kashmir, selling to some of the greatest museums in the world as well as advising and helping private individuals form collections of world-class quality.